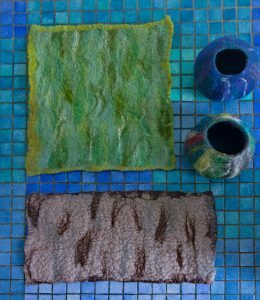 Felt making is the fascinating art of creating textiles using wool, water and soap. 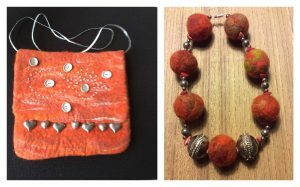 Projects covered include flat felting for pictures, cards, book covers and wall hangings, jewellery, 3d felting for bowls and bags and nuno felting for scarves and collars. Felt making is highly addictive and after a while participants gain the confidence to develop their own projects using the wide range of materials available. There are two groups, Beginners and Improvers, with each group usually meeting once a fortnight. The Beginners group is for those who have no prior knowledge of felt making and is technique based. Participants build on the skills they learn each session, which means regular commitment is required. The Improvers group is for those who have participated in previous U3A sessions or those who have some knowledge of the craft. The sessions are project based. Places are currently limited by the size of the Convener’s work room but it is always worth registering your interest, as it is often possible to arrange drop-in sessions, if regular group members are away. ☐ When : Wednesday, 10.30 a.m. – 12.30 p.m.